she's done this a few times before. The first thing you'll do when you arrive is sign in in the NMA registration room. 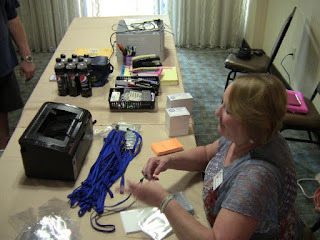 So, the first thing our volunteers do is get that room ready for the onslaught of MUs that will start pouring in today. The registration room is our headquarters. During the reunion, this is where you'll find coffee, schedule changes (on the rehearsal board by the door), merchandise, conversation and the all-important check-in sheet. You check the check-in sheet to check up on who has arrived since the last time you checked the check-in sheet. Your name tag will be waiting for you.